Easy to grow and ideal for sunny dry positions, babiana flower in late spring and early summer on 20 cm stems. 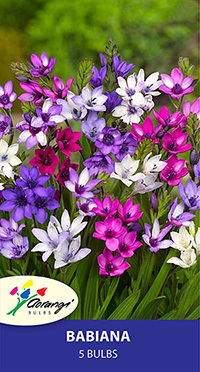 This hybrid mixture contains blue and purple shades. This hybrid mixture contains blue and purple shades. Easy to grow and ideal for sunny dry positions, Babiana flower in late spring and early summer on 20 cm stems. 5 bulbs per pack.